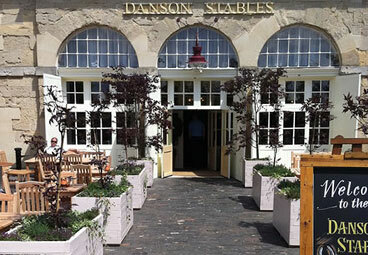 Taylor Made Planters worked with Danson Stables restaurant and bar in Kent to create 8 custom made wooden planters. These quality restaurant planters are used to display plants and trees, creating a beautiful walkway to the front entrance of the business. The large outdoor planters also function as attractive barriers that separate seating areas for the diners. Each planter is painted to match the exterior colour of the restaurant.